Being a beauty blogger means I'm constantly on the lookout for 'the one' when it comes to skincare, and I very rarely find something I wanna stick to forever. I'm constantly changing up my skincare routine and trying out new products I read about on bloglovin' or in the latest magazines. I don't think I'll ever find a set of products that I'll stick with as there's always new products coming out that I need want to try. Plus all you enablers out there don't help! I've found a couple of little gems recently that I'm really enjoying using together, one of which is actually a repurchase (I know, right?). Yes to Skincare is a brand that's relatively new to the UK highstreet (I think). 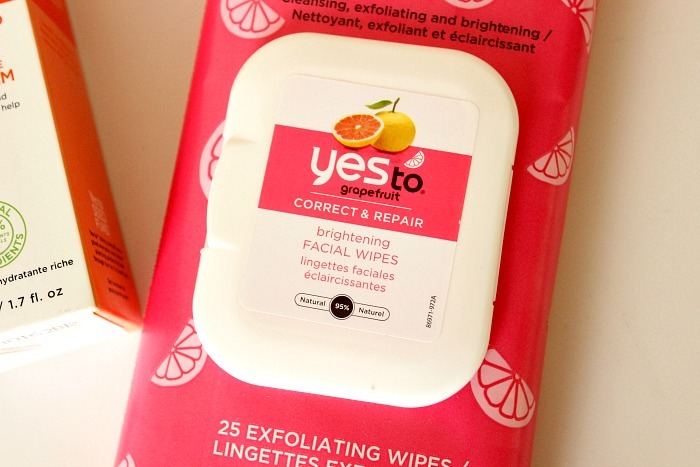 I first heard about their products from Lily Pebbles a few months back and I knew I had to give them a go, so off I toddled to Boots where I picked up a packet of the Yes to Grapefruit Exfoliating Brightening Facial Wipes (£3.99). I knowwwww, wipes are frowned upon, but these aren't like your regular 'makeup removing' wipes (no thanks), they're designed to exfoliate and brighten the skin after cleansing. I began using these as a quick wake me up / toner on a morning and absolutely loved the results. Fast forward a couple of months and I'm back into them big style and onto my 2nd packet. Each wipe is a generous size and really soaked which I like, as I hate wipes that feel dry and irritate the skin. They're not greasy or oily and they don't leave any kind of residue behind. I find they really make a difference to my skin and I definitely notice when I don't use one on a morning. When I was on the lookout for a rich moisturiser for the winter (my dry skin freaks out) I once again took to the aisles of Boots and thought I'd give another product from the Yes to line a try. 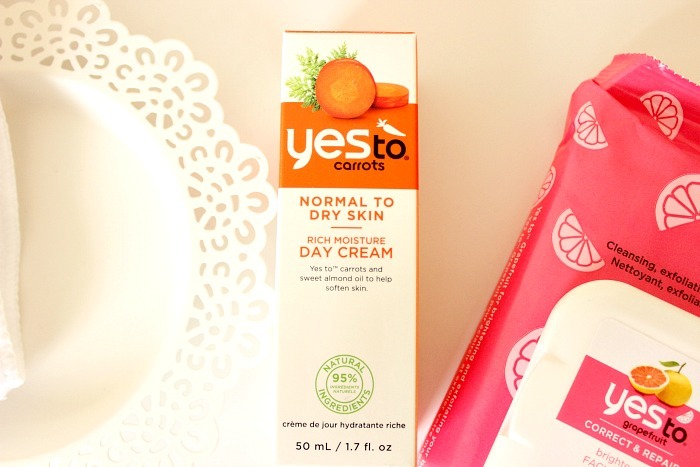 I picked up the Yes to Carrots Rich Moisture Day Cream (£9.99) and I haven't been disappointed. What I love about this moisturiser is that it's not as heavy or greasy as your usual rich day creams. It feels lightweight, yet really hydrating on the skin. It takes about 5 or 10 minutes to fully sink in and I find my makeup applies really well over the top of it. It comes in with a pump (my favourite kind) and I find that half a pump is ample so it's definitely gonna last a while. Have you tried anything from Yes to?